Alan Stein is an internationally renown basketball strength & conditioning coach. He was the owner of Stronger Team and the Head Strength & Conditioning Coach for DeMatha Catholic High School's basketball program. Alan has over a decade of experience working with elite high school, college, and NBA players. He currently travels the world conducting his Cutting Edge Clinic series and offers a variety of resources to help players & coaches of all ages and levels. Alan is a former Division I basketball player, and thus knows what skills are necessary to become a good basketball player. His drills, programs, DVDs, etc are geared specifically to help basketball players develop those physical skills needed to become a great player. 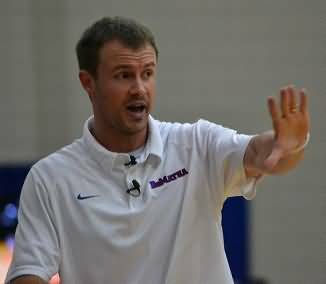 Alan's passion, enthusiasm, and innovative training techniques make him one of the world's leading experts on productive training for basketball players. He is a performance consultant for Nike Basketball as well as the head conditioning coach for the annual Jordan Brand Classic, the CP3 Elite Guard Camp and the Nike Basketball Summer Skills Academies. Alan is a former camp coach at the prestigious NBA Players Association's Top 100 Camp as well as the former strength & conditioning coach for the McDonald's All-American game. "Alan Stein, in my opinion, is the premier basketball strength & conditioning coach in the world. His conditioning and strength training programs are specific for basketball, not just any sport. In addition to his programs, videos, DVDs, he does numerous clinics, while being the Head Strength & Conditioning Coach for DeMatha Catholic High School, always a USA national powerhouse team and program. Alan has a number of excellent youtube video clips that, with his permission, I have categorized for you here, and are presented on the linked pages below. I have also included links to his excellent DVDs below. All basketball coaches need to implement a strength and conditioning program. Many of us older coaches can remember pre-season running, sprinting, calisthenics and the like, but that was it... really nothing during the season, and nothing was really specific for basketball. Coach Stein's programs and videos are just what you need, to bring you up to speed. Keep in mind that these pages show only a small sampling of video clips. For the whole picture, get the DVDs or get in touch with Alan and attend one of his excellent clinics. And rather than me commenting on the drills, let me just say that they are all excellent, and I'll let you just watch Alan's video clips for yourself. He'll explain and demonstrate everything far better than I could"... Coach Gels.